Fate is defined as "the development of events beyond a person's control." My newest home is The Liberty Hotel Saigon South. I chose the hotel from the internet, and fate assigned me to room #410. In numerology 410 is a 5, a number which is "unpredictable, always in motion and constantly in need of change." That makes sense, because once I arrived in this room I wanted to get out. How could I spend a night here, I wondered, when I first realized the nature of this room, much less the week my nonrefundable reservation had committed me to? Room #410 has a magnificent spread of windows but also a broken airconditioner. Once in my new home, I immediately opened all the windows, which allowed two phenomena to enter the room: a lovely cross breeze that would work just fine as a fan (which I far prefer to airconditioning) and, two, an assault of street noise from four flights below me. The street noise rose off the hot asphalt like exhaust from a jet engine. It was a carpet of noise, incessant, blaring and un-symphonic. A carpet of horns, internal combustion engines and moving tires. A carpet of a thousand shifting gearboxes, a million burning tires and billions of cubic meters of spewing exhaust. A continuous cry of time trapped inside its choices and inventions. I made it through my first night in room #410. It was in my morning meditation that I realized I would be staying put, taming the energy of room #410, instead of asking for another room, instead of having room #410 master me. Beside me are strewn the trappings of my trade as part-time wanderer: my camera, earplugs, notebook, sunglasses, wallet and the bananas I bought yesterday on my first walk in Saigon. Besides a well-lit room with windows that actually open, there is a second fundamental need I have wherever I am: to walk. I chose this hotel from the internet because it was located in district 7, a district the internet claimed had wider and quieter streets than most of Saigon and I thought, I'm ready for that. But my walk yesterday revealed the opposite: streets so dense with traffic they are hazardous if not impossible for a pedestrian to cross. Streets with sidewalks typical of certain parts of Asia, which means irregular to non-existent. And untold acres of concrete buildings with one of the highest ratios of cement to trees that I'd ever seen. I felt I was living in a bunker of noise surrounded by a landscape exfoliated of plants. 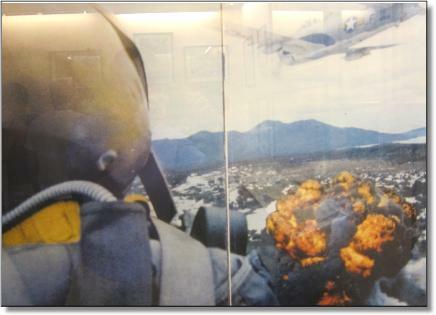 These battle images were apt: I'd come to Saigon because of the war. I'd taken five trips to Cambodia but I'd never set foot in Vietnam, even though when I first dreamed of seeing Southeast Asia it was always because of Vietnam. 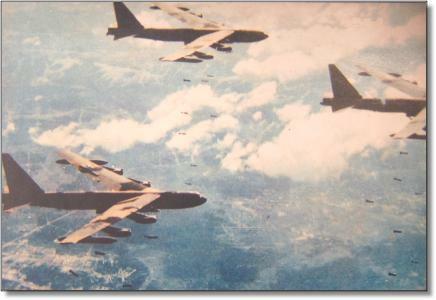 Even though I didn't fight in the war it was still the seminal political event of my middle and late adolescence, and it was a bond my father and I shared, one of the few things we could agree on: that the U.S. involvement in Vietnam was wrong, or had gone horribly wrong. Every dinner in our home was accompanied by the CBS Evening News with Walter Cronkite and the reports from Vietnam. Casualties, evacuations, Agent Orange, the Tet Offensive and the massacre at My Lai. My father rued the war with greater intensity with each passing week. I absorbed the news, agreed with my father and was vaguely apprehensive of the draft I might face upon graduating high school. I lay in bed last night, thinking about my father. Or did I just dream about him? I've been dreaming about my father a lot this last month, almost five years after he died. I would like to call him on the phone and tell him, "Dad, I'm in Saigon." I'd like to tell him what it is like here, he would be so interested. The open windows and the noise of the street invaded my dream landscapes last night as I crossed the liminal membranes the night journey brings. My father has arrived in Saigon and is mixing with the noisy battleground outside my window. Am I writing to him, or for him? Last night, before going to sleep, I watched a little bit more of "American Sniper," the movie by Clint Eastwood, upon release hugely popular and controversial. I came across a bootlegged copy at a DVD store in Phnom Penh and bought it for a dollar and fifty cents. I've been parsing it out for three nights now, watching twenty minutes at a stretch, seeing what I think of it. It is showing the mind of a certain type of violent God, family and country-loving patriot. It's certainly not about the type of soldier my father would admire - and my father was a soldier - but it is here, with me, part of the postcard of Saigon that is composing itself in room #410. 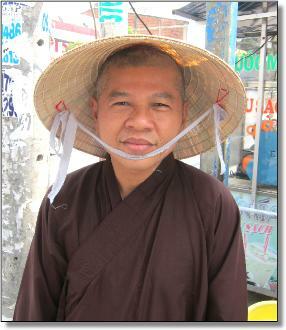 I met a man in Phnom Penh before I left, another American, whose name was Max. 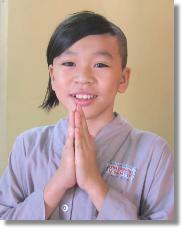 Max has done interfaith peace-fostering work in this part of the world for many decades and knows Southeast Asia well. I told him I was going to Saigon and he suggested I see the War Remnants Museum. I felt somehow that I was receiving not just advice but an assignment. This morning I spoke with another man, Peter, the director of the Cambodian NGO I'm doing volunteer work for and Peter mentioned the Hotel Continental Saigon, famed colonial-era watering hole, a place Graham Greene wrote from, a place war correspondents gathered, a place that partly defined Vietnam war-era Saigon. Again, I felt I was receiving an assignment. I knew the Hotel Continental was probably devoid of its past, but sensed it would be a good place to begin a meander, to wander further into the postcard. As it turned out, I was the only lunchtime guest in the garden restaurant of the Hotel Continental and paid three times as much for a bowl of soup than I would have just about anywhere else. The hotel was so refurbished of its past that it seemed to have just been built. Most of the staff were putting up decorations for a wedding that was to be held later that day. Besides tables and white tablecloths, the garden was filled with trees whose trunks twisted into canopies overhead. It was comforting to be in a lower concrete to tree ratio and I found my overpriced soup to be delicious. Within ten minutes of finishing my soup I was inside the War Remnants Museum grounds. I bought my ticket and turned into the arms of a man hawking books, except the man had no arms. At least no forearms. He'd lost them and one of his eyes, as he explained, in a landmine explosion. He held out his right elbow and I shook it. I could see I was soon going to be paying more money than I needed to again, but I bartered down the cost of "The Tunnels of Cuchi" from $20 to a more reasonable $15. After I paid him the man was instantly on to other customers and I looked around the courtyard which contained various Vietnam-era American weapons - a tank, a helicopter, a howitzer cannon. I looked them over and entered the museum, a three-story building with primarily western tourists streaming in and out of it. The War Remnants Museum is largely a museum of photographs and through them one is taken on a journey back into the Vietnam War and then forward again into this time, forty years after the end of the war, because people are still suffering, especially from Agent Orange, and people are still being killed by unexploded American ordinance dropped in Vietnam and Laos. The camera shown at the beginning of this essay was one carried by the Japanese war correspondent Taizo Ichinose. One can see a bullet hit the camera. 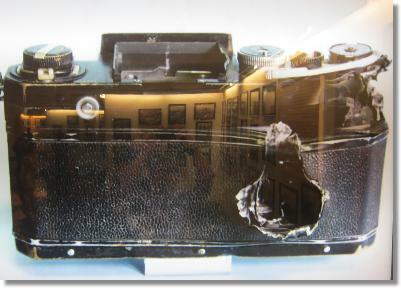 The camera, which took the bullet and saved Ichinose's life, is now part of a family shrine in Ichinose's home town in Japan. 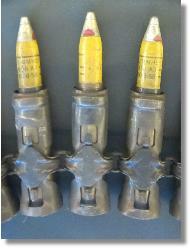 The War Remnants Museum is a shrine comprised of photographs. Yesterday I took a walk in my neighborhood. I ventured down one of the small side streets. I'd been here long enough to feel comfortable doing this. It's not that I suspected danger on the side street, far from it, but I felt I needed to acclimatize myself to Saigon before plunging into its intimate interior, because that's what the side streets are - just like in Bangkok - grottoes of homes and street-side commerce. Small oasis in which people's homes open onto the street and people are encountered in all the intimate detail of domestic life and commercial life, two types of lives woven together into minute neighborhoods far, far removed from Western suburbia (though there are Western-style suburbs here, too). One house is also a barber shop, another a furniture repair business, a third a small grocery. The street dividing one shop from its opposite neighbor might be five paces wide. Acclimatizing myself meant becoming familier and in this way showing respect, like taking off one's shoes before entering a shrine. I'd been finding respite from the noise in the side-street neighborhood, in fact in there it was almost eerily silent, the two and three story buildings effectively blocking the main street noise flow and explaining how so many people could live with so much concrete and motorcycles. Here there was no noise, the motorcycles passed by slowly and far in between, and the concrete close up and so densely inhabited was a very different concrete than, say, the side of a hotel or the overpass of a freeway (which is what my hotel windows see). I did encounter a shrine on my walk. Spotted it as I glanced down an alley, a sight I might so easily have missed as to be a needle in a haystack, since where in all this concrete might another shrine reside? I approached what looked like a very well appointed shrine slowly, with caution. What were the protocols and what exactly is this? Was this a Buddhist pagoda or Chinese Shrine? Inside the courtyard I was met by two small boys, one of them dressed in grey robes as if he was some kind of marshal arts acolyte. 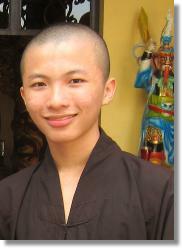 I soon realized he was a novice monk. His head was shaved except for a big foot-long lock of hair that flowed across his forehead like an elegant sash. His eyes were clear, dark and large a doe. He seemed to understand at least some English and answered my questions with a polite and warm reserve. This master-to-be brought me four incense sticks and showed me to the four shrines where I could offer them. After the incense there wasn't much more to say, or so it seemed at the time. Nor did I know how much English the boy could understand. I said goodbye regretfully, already missing the shrine and the boy who so graciously assisted me. I turned around twice as I walked away and we waved to each other each time. Last night I finished American Sniper. The ending seemed a copout on Clint Eastwood's part, a big gush of flags and tears and patriotic sentimentality. Other than the last ten minutes, the film seemed to take a non-aligned stance. The violence of war was graphically and brutally told, and the long-term effects of war were only hinted at, but at least the hints were part of the film. If anything, the film seemed to be saying, this is war. Take a look at it and form your own opinion. In that sense it was as much an antiwar film as not, since as the film went on, the reasons for the war in Iraq seemed to become all the less tenable. And the killings, on both sides, more senseless. I know many saw it differently because it conflated Osama bin Laden with Iraq, and carried other half-truths, lies and propaganda onto the screen. But I felt this was simply showing what the protagonist himself believed. The real Chris Kyle - American Sniper is based on Kyle's autobiography of the same name - saw things in a black and white way (I've read enough of his book to know that): killing the enemy who is doing evil things and trying to kill your comrades is good, even good in the eyes of God. He saw the enemy as a traditional warrior would. A different view of warriorship is found in, say, the writings and teachings of Thich Nhat Hanh, Buddhist teacher and surviver of the Vietnam War. When I went back to the Pagoda today I meant several monks who reminded me of Thich Nhat Hanh, extremely gentle young men with wide and willing smiles. One of them spoke a bit of English and took up where the doe-eyed boy had left off, showing me around the temple grounds and inviting me for lunch. 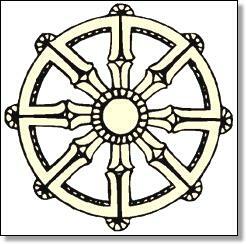 Thich Nhat Hanh has worked tirelessly to end war and teach peaceful ways of resolving anger. Above all he has taught people to see that the enemy is in oneself, that any "evil" we condemn in the outer (dualistic) world can be found inside us, since we all experience the arising of anger and hatred and the other forces that make up what we call evil. Abbot of the local pagoda. The moon and the sun are eternal travelers. Even the years wander on. A lifetime adrift in a boat, or in old age leading a tired horse into the years, every day is a journey, and the journey itself is home. 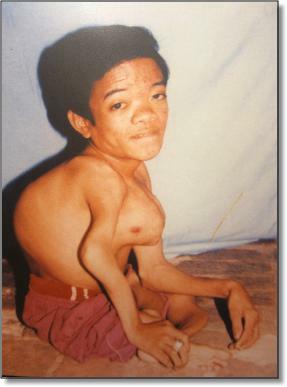 In 1969 it was revealed to the public that the 2,4,5-T (a component of Agent Orange) was contaminated with a dioxin, 2,3,7,8-tetrachlorodibenzodioxin (TCDD), and that the TCDD was causing many of the previously unexplained adverse health effects which were correlated with Agent Orange exposure. TCDD has been described as "perhaps the most toxic molecule ever synthesized by man". Internal memoranda revealed that Monsanto (a major manufacturer of 2,4,5-T) had informed the U.S. government in 1952 that its 2,4,5-T was contaminated. 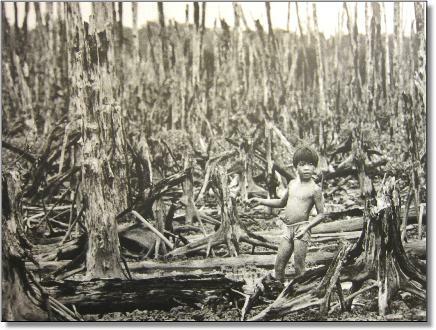 The photograph above shows what Agent Orange does to the land, in this case a former mangrove forest. 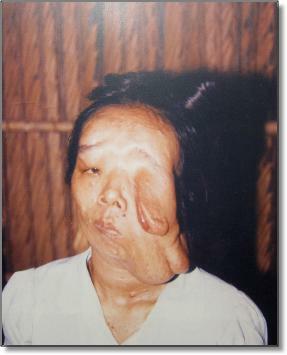 The photographs below show what Agent Orange does to the human body, both through exposure and through genetic deformity. These photographs are not easy to see, and I share these in the spirit of bearing witness and not forgetting. I've seen people in Cambodia who look like those in the first and second photographs above - they are not uncommon to encounter - and I bought tangerines yesterday from a women who looks much like the naked woman in the third photograph. When I paid for the fruit and said thank you and smiled at the woman, and she smiled back quite warmly. I'm writing from room #410 on my sixth day here. Outside of the War Remnants Museum and the Agent Orange victim selling fruit (I bought apples from her yesterday) I've gathered little evidence the Vietnam war occurred. Most of the people I pass on the street are less than forty years old and so were born after the war ended. Maybe they don't even believe it happened, the way young people in Cambodia, I was told, don't believe the Khmer Rouge killing fields happened. I'm sure they do believe, and yet there is a truth to that, how the most seminal historical events become a blur or half-believable hagiography precisely because they've been told so many times. And, of course, nothing is real the way right now is real. I've made peace with room #410, and yet a certain horror remains. Saigon. I've called this city "Saigon" rather than Ho Chi Minn City because of melopoeia, how the sound of Saigon as a word is so beautiful and somewhat sad. I feel as John Cage did when he said, "If something is not beautiful I ask myself why, and I can't find an answer, and then it is beautiful." That is the way I've lived this last week. That is how I always try to live. There is infinite beauty and yet from another view all the concrete and motor traffic, all the noise and smog and bridges are endless and dominant. It's no different here than anywhere, just more so. Noise and smog have given birth to more concrete and fewer trees. It is in motion, a calamity encircling itself. We are caught in it, hurtling down one-way streets, as yet unable to collectively imagine an alternative.